We’ve left Yala National Park on the south coast and bumped, switched-backed, avoided pot holes, trucks, buses, dogs, tuk tuks and landslides along the road to Nuwara Eliya. We’re now 2000 metres above sea level. In Little England. Home to (in my opinion) the best tea. 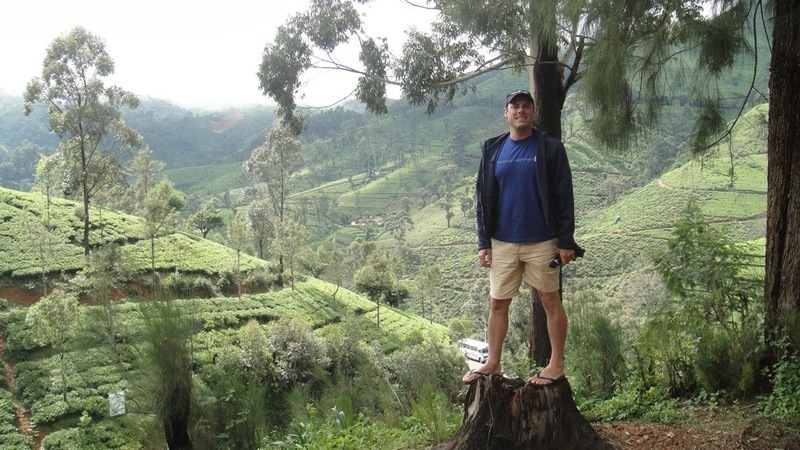 The tea estates have names like Brookside, Devon, St Clair and Summerhill. Each estate has a rambling bungalow set aside for the Estate Manager, nestled on the edge of one of the terraced hills that plunge down to the valleys below, and it is at St John’s that we reside in colonial splendour. Each valley resembles a garden of perfectly manicured tea plants. The tips of these plants (a relative of the camellia) are carefully plucked by the Tamil tea pickers, who are resplendent in brightly coloured saris, bare feet, and smiles that no dentist would own up to. Each day they work in lines across the steep hills. Carrying large baskets that hang from the back of their heads (an osteopath would never be short of work here), they toss the fine leaves into this basket discussing the price of rice and what a stunner Rahani is with her narrow hips and beautiful tooth. Our bungalow is now someone’s holiday house, with fireplaces, wide wooden halls, massive bedrooms and a lounge with a natural Christmas tree that reaches the 3.5 metre wooden ceilings. The bedrooms’ bay windows look over an English garden and down to the mist shrouded valley below. The Arndts descended into the four bedroom bungalow (not counting the servants wing) in a whirl of exhaustion, excitement, and wonder at the twinkling Christmas tree weighed down with decorations. I don’t know who decorated the tree, but any department store merchandiser would hire them in a flash! 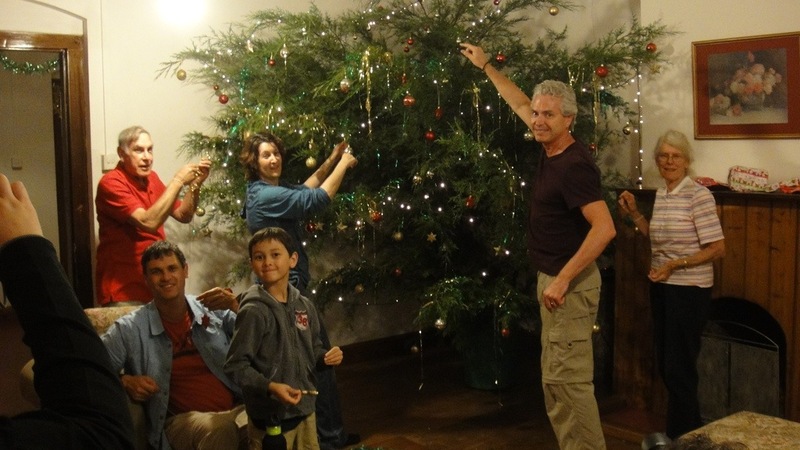 Shame about the additional tinsel and decorations that we then adorned the three metre cedar tree with. The Arndts have never worked on the less-is-more theory: more and more is never enough! If there is a branch that isn’t groaning under the strain of baubles, then hang another glass reindeer on it. The poor Tamil houseboys didn’t know what hit them! Within twenty minutes, we had loaded their kitchen fridge with wine and tonic water, Christmas carols were playing and the tree was surrounded by presents. We had arrived, and although the houseboy greeted us bearing a tray of tea, fine china and hot milk, gin and tonics were decided to be more appropriate. We all agreed that a trip to the Church of the Holy Trinity for an early morning Christmas service would be the perfect start to Christmas Day. At 6am the next morning, however, not everyone was as enthusiastic so five of us headed out in our Sunday best. Even Mike my wonderfully atheist partner was in on this number. I can always talk him into a Christmas church service if he gets to belt out a few Christmas carols. Inwardly, I was hoping that the carols would be recognisable, and in English, but he didn’t need to know that. After a 30 minute drive along a winding road that skirted the edges of wakening tea estates, we arrived through the mist to a church that looked like it was straight from ‘Midsomer’, complete with a surrounding cemetery full of colonial names (however no murders today). I always feel like a hypocrite if I don’t attend church on Christmas Day so the service and the welcome we received made for a wonderful start to the day. Mike was happy with ‘O Little Town of Bethlehem’ and ‘O Come All Ye Faithful’. We returned to St John’s to have what was promised to be a wonderful English Christmas lunch. I just don’t remember curry and sambal being a tradition on Christmas Day. Boxing Day we made another excursion into Nuwara Eliya to the ‘winter markets’ to purchase some winter clothes and watch in amusement the locals sporting beanies (toques for you Canadians), ear muffs and ski jackets. At 18C, the winter gear on the locals was overkill, but if you live in a constant tropical climate, eighteen degrees must seem like blizzard weather. We finished our day’s visit to Nuwara Eliya in Sri Lanka’s ‘winter wonderland’ at the Hill Club, a bastion of the British Planter. The Hill Club is surrounded by rose gardens and perfectly manicured lawns – “croquet anyone?”. It is a private club that resembles an English stone manor house, that the planters would travel sometimes a day’s journey to. It was here that Alistair and Piers could play billiards, read about ‘home’ in English newspapers (even if the edition was a week old, and most of the members were born in Ceylon), Marjory and Harold could dress for dinner, eat roast beef with yorkshire pudding and lashings of gravy, while discussing how the Hamilton Browne-Thompsons had gone native. So the days before we leave will be filled with walks through the tea gardens, reading, and of course the ubiquitous Gin and Tonics by the fire. Okay, I’m a Hamilton Browne-Thompson wanna-be… (isn’t that right, Tricia-Louise Hamilton Browne-Thompson of the Kent Hamilton Browne-Thompsons?). It was ‘tootle pip’ this afternoon to our tea estate bungalow and the staff, who – I kid you not – stood in a line as we left. It was quite touching really, although I think it was more for the tips that we handed out than out of dedication. Then the 5 hour drive down from the mountains to the airport, more switchbacks, potholes, dogs, cows … and a mini Perahera. Traffic came to a stand-still as a procession of dancers and elephants, complete with flashing LED lights down their trunks, paraded down the main street (which was also the highway!) into the town’s temple. Those elephants were lit up brighter than Subi Oval for a night game. God knows where the power source came from; we certainly didn’t see an extension cord trailing down the road behind the pachyderms. Now we sit bleary-eyed in the airport restaurant – and we haven’t even left Sri Lanka yet! Like all airport restaurants it has no atmosphere and is completely overpriced. But it’s approaching midnight and we had to sneak in one last curry. I tried to talk Mike into sitting on a very tanned – well actually, an almost black – Santa’s lap for a photo opportunity. It was one of those cheesy set-ups you see in most shopping malls at Christmas time, but I think the endless loop of Christmas carols in the pre-departure lounge had got to him. So it’s back to board shorts, a good Australian Chardonnay, watching the sun set over Cottesloe beach, while planning our next trip back to Sri Lanka (September 2013 incidentally). Hope you enjoyed the trip as much I did. 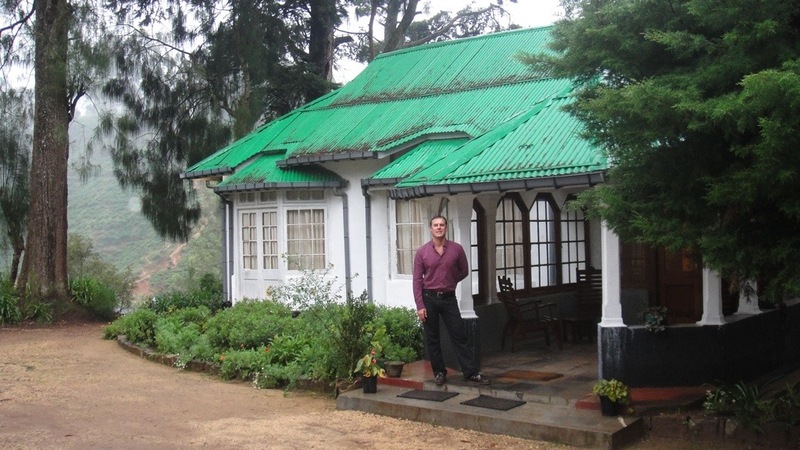 This entry was posted in Sri Lanka and tagged Nuwara Eliya, tea plantation bungalow. Bookmark the permalink.